(click on thumbnail photo for larger version). 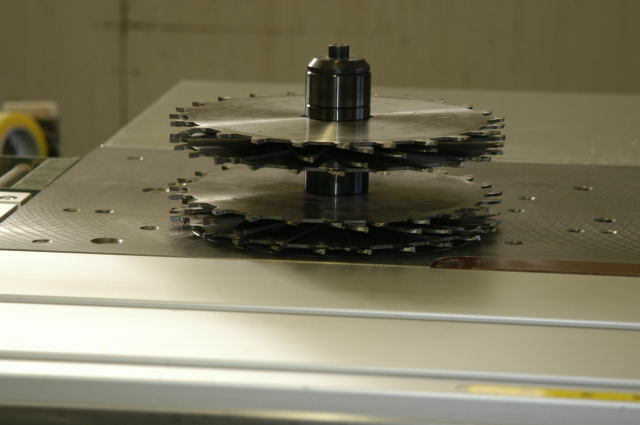 A pair of Forrest Dado Kings drilled for and mounted on the 30mm shaper spindle. 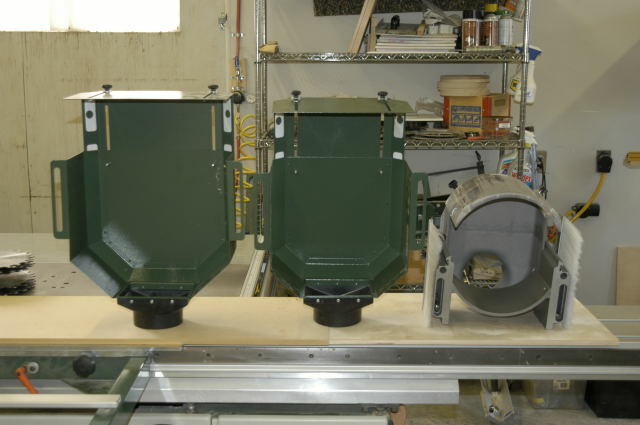 Three different Tenoning Hoods (right to left): Aigner BowmouldMaster, Felder Smaller Tenoning Hood, Felder Larger Tenoning Hood. 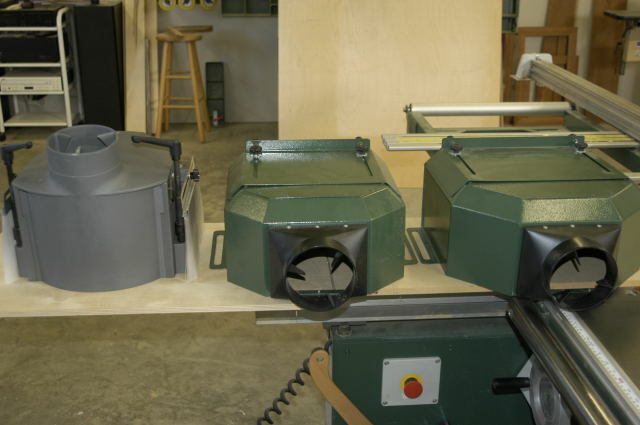 Three different Tenoning Hoods with cutter window fully open. Same hoods as shown from the rear. Same Hoods with fully extended front covers shown from underside. 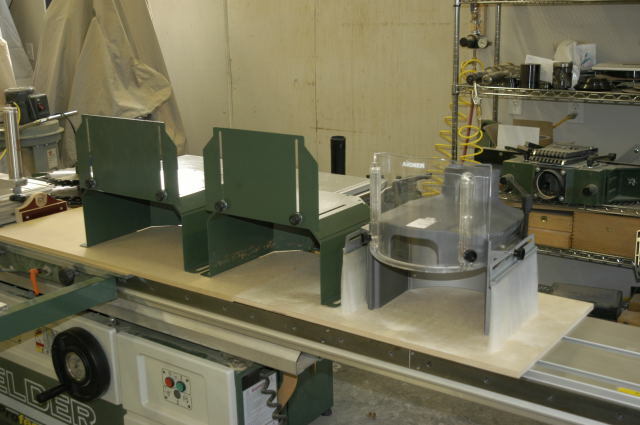 Both Felder hoods attach to the iron top of the shaper with hex-head bolts. The larger hood requires two new drilled and tapped holes be added to the top. The Aigner BowmouldMaster also requires new threaded holes in the top. 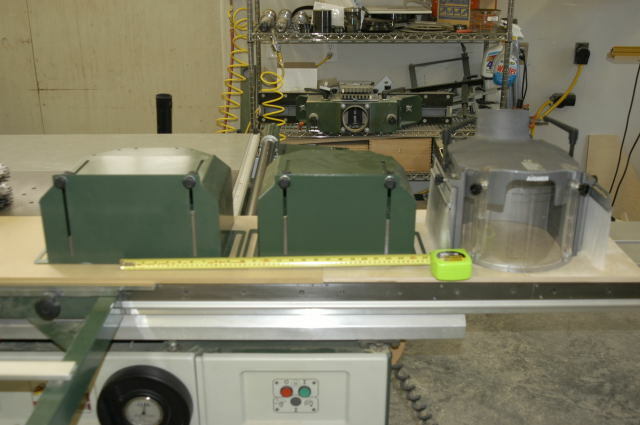 Setup of "window bracket" safety device on sliding table. This safety device comes with the smaller tenoning hood. It is not available separately as a standard product. 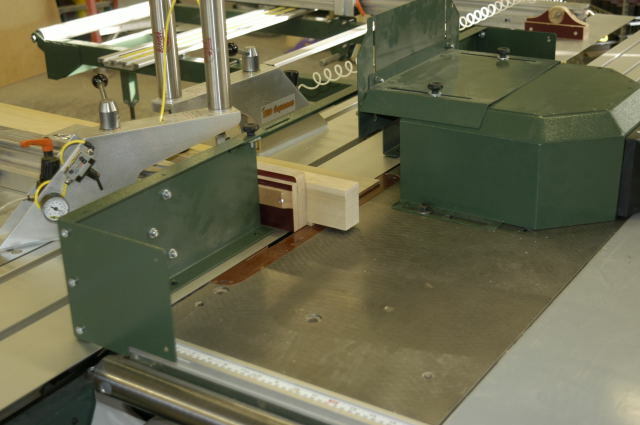 The stock projects through the "window bracket" safety device into the area of the cutter. 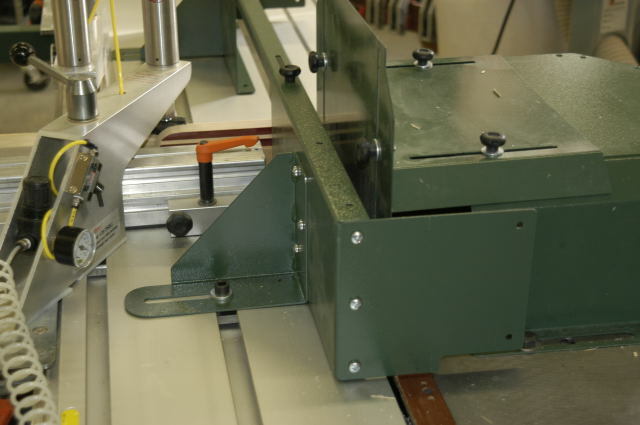 Here is the setup to cut a tenon using the dual Dado Kings. The "window bracket" has wings at each end that cover the exposed cutter. The width of the "window bracket" opening is adjustable, and the device clamps to the sliding table with hex-head cap screws into t-nuts. 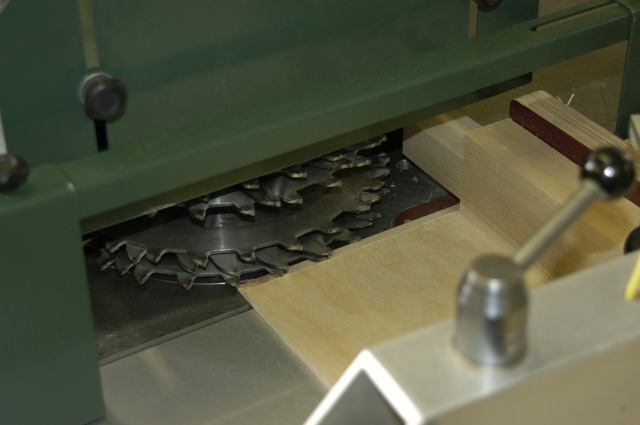 Since the Dado King is too large to lower into the shaper cutout area, it must be operated above the table. 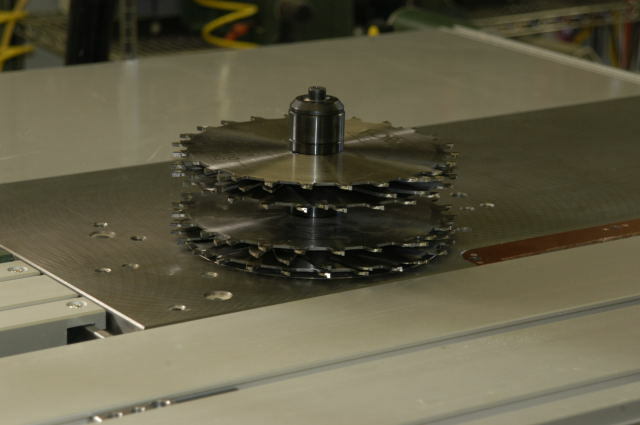 This gives rise to the need for something to elevate the stock to the height of the lower cutter bottom edge. Here I'm using 1/4" plywood to raise the stock. 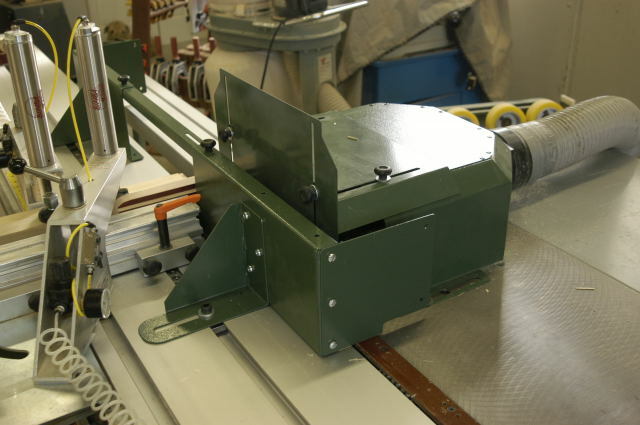 A shop-made splinter tongue is used as a backstop to prevent tear-out. The Tenoning Hood comes with a diagram on the critical dimensions to make your own version. 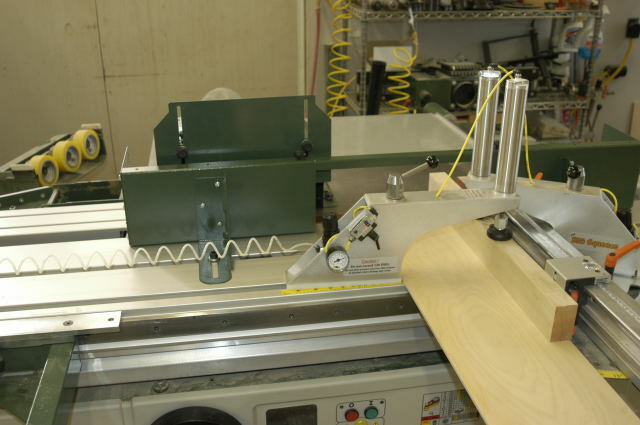 On the newer X-Roll sliding tables with newer crosscut fences, the tongue is not required, but some form of backstop is recommended to limit tear-out. This shows the wing on the forward end of the "window bracket." 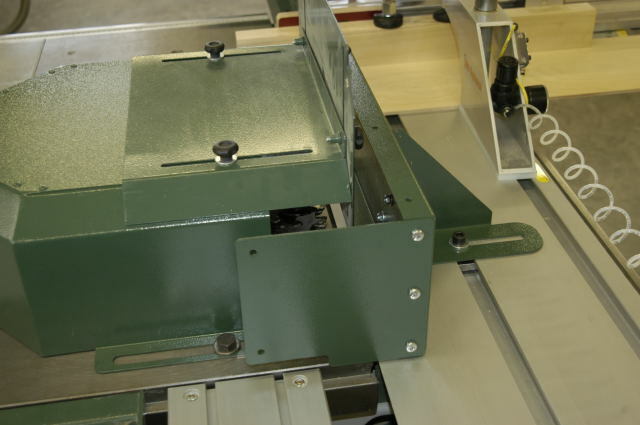 It closes off the cutter and prevents the sliding table from advancing to expose the cutter. Close-up of end-wing on the "window bracket" device. 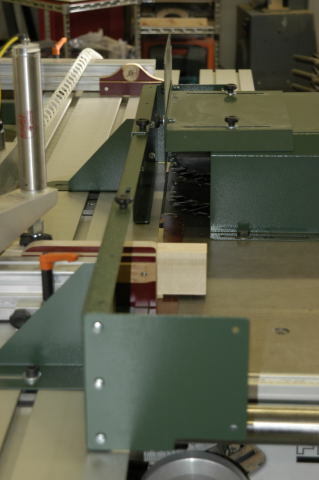 This shows the "window bracket" opening for the stock to protrude into the path of the cutter. The window width is adjustable by loosening the top L-bracket and sliding together the braces that attach to the sliding table. 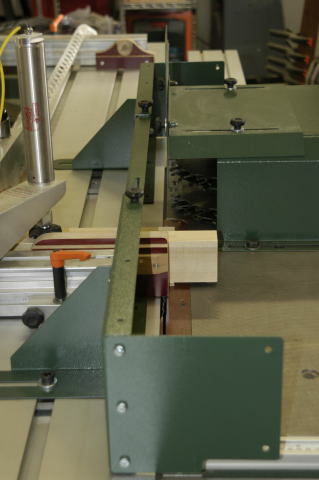 Close-up of resulting tenon. 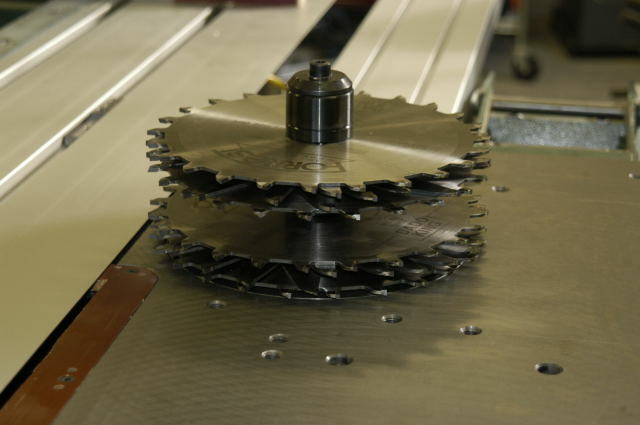 The quality of cut with the Dado King is surprisingly good.